The Sioux Prairie Quilters’ Quilt Show takes place annually during Orange City’s Tulip Festival, May 17th – 19th. At the show, visitors have the opportunity to view nearly 175 handmade quilts. Various quilting demonstrations take place during the day as well. The quilt show is open Thursday, May 17th, and Friday, May 18th, from 9:00 am – 7:00 pm, and Saturday, May 19th, from 11:00 am – 6:00 pm, at MOC Floyd Valley High School (615 8th St SE, Orange City, IA, 51041). Admission is $5 at the door or tickets are included in the Tulip Festival Value Book. The show also features bed turnings twice each day. Bed turnings are a traditional way women shared their quilts with one another. They met in homes, and since there wasn’t room to display all the quilts at once, they layered them on a bed. As each quilt was uncovered, the maker told its story: where she got her fabric, how she chose it, how much fabric she used, her pattern, and any challenges she had during the making. The SPQG bed turning includes contemporary, vintage, and historical quilts along with their stories. View the bed turnings at 11:00 and 4:00 each day. We assume that most of our readers are already quilters. But, maybe you (like our Museum Director) are an avid quilt admirer but don’t yet quilt. At the Beginners Quilting Retreat hosted by Avoca Retreat, Colleen Arnold will guide students through patchwork and quilting for beginners. 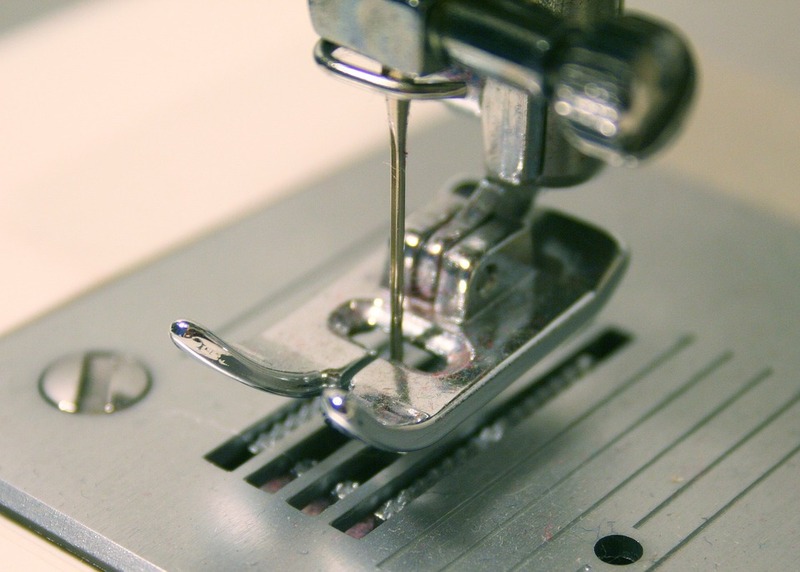 She will cover all aspects of quilting from piecing to binding. Students will choose from a couple of simple projects, each focusing on a different technique. Clear step-by-step instructions will accompany each project. Colleen will also explain common quilting and sewing terms. Students should be able to take home a completed throw sized quilt at the end of the retreat. The retreat begins Friday, June 8th, at 6:00 p.m. and concludes Sunday, June 10th, at 1:00 p.m. The cost for this fun weekend is $125 + tax per person plus one co-op meal. Only ten spots are available; call Janine at 712-310-2110 to secure yours. You can find more information (including a supply list) at the Avoca Retreat Facebook page. Known as the Quilt Capitol of SE Iowa, Kalona is the home of the Quilt & Textile Museum located in the Kalona Historical Village Welcome Center. The museum features two nationally acclaimed galleries, one for Amish textiles, and a second with an ever-changing theme for English (non-Amish) pieces. New exhibits are created every three months, so if you have visited the museum in the past, chances are you will discover something new with each visit. Marilyn Woodin, an avid quilt collector and former curator of the museum, started the collection in the year 2000. Since that time, the collection has expanded and is now kept in humidity & light controlled rooms. Many exhibitions also include quilts on loan from other museums to complete a theme or collection. Visit the Kalona website to read about all the attractions one can find there. Barn quilt blocks are a form of public art that has seen incredible popularity in the last two decades. A drive through the Iowa countryside (off the interstates) will almost certainly reward one with a view of at least one barn quilt block. Several communities have even organized maps of barn quilt trails whereby drivers can see many quilts in a single trip. Washington County has a particularly well-evolved barn quilt trail—four trails to be exact. 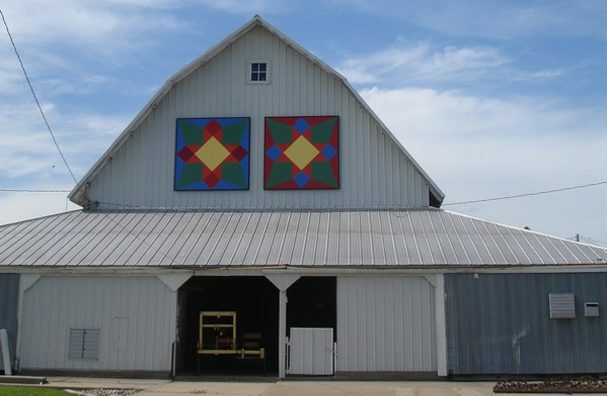 The Washington County Barn Quilt Committee started this project in January of 2007. They chose the Pumpkin Seed quilt pattern as their official project logo to represent the four driving trails, or loops, in the county. The four loops each have a unique theme: Amish Loop, Liberty Loop, Nature Loop, Agricultural Loop. The last loop was finished in 2010. It is difficult to have an accurate count of just how many barn quilt blocks are in county because several barn-owners have put up quilt blocks on their own, but there are well over 120 barn quilts in Washington County. You can find a more detailed explanation of the Washington County barn quilt project and a map at their website. Washington County is located south of Iowa City and includes the towns of Washington & Kalona, among others. It sounds like a trip to their neck of the woods is in order soon!